Kia convinces Supreme Court of New Jersey to hear an appeal in a case that goes back to 2001. December 30, 2018 — A Kia Sephia brake pad lawsuit that took 17 years to settle may not be settled after all. 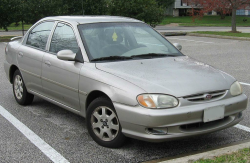 Plaintiff Regina Little filed the class-action lawsuit in 2001 after she claimed the brake pads and rotors had to be constantly replaced on her 1999 Kia Sephia. The lawsuit alleges brake pads should last at least 20,000 miles, unless those pads are on a Kia Sephia. The plaintiff alleges the Sephia brake pads wear out at 10,000 to 12,000 miles because defects don't allow heat to escape, resulting in vibrations and grinding from the brakes. Sephia owners claim they replace their brakes and rotors every six months, an expense laid on owners because Kia's warranty doesn't cover brake components on the affected cars. A New Jersey jury ruled in favor of the plaintiff in 2008 and found Kia violated implied and express warranties as well as the Magnuson-Moss Warranty Act. By the time it was over, the jury found Kia should pay about $6 million to owners of 1997-2000 Sephias, a total that would have provided each affected owner about $750. However, the trial court judge decertified the class-action and ordered a new trial based on repair damages only because there was no way to determine damage amounts based on individuals and their Sephias. The next move came from a "special master" who was appointed in 2015, but their determination of the case found only 150 Sephia owners had proved their damage claims. In place of the original $6 million award to Sephia drivers, the special master said the specific owners would receive just $46,000 that would be split 150 ways. But attorneys for Kia owners requested more than $6.5 million for fees and costs, a huge amount considering 150 car owners would receive $46,000 for all of them. In steps a new judge who dropped the attorney award to about $700,000. But this still left another appeal from the Law Division of the New Jersey Superior Court to the judges of the Appellate Division of the Superior Court of New Jersey. Based on what the Court said was "recent case law unavailable to the trial judge," the panel ruled to reinstate the original $6 million jury award. In the latest move for a case the plaintiffs thought was finally over, Kia appealed to the New Jersey Supreme Court whose judges said they will hear the case. The Kia Sephia brake pad lawsuit is entitled, Regina Little, et al., v. Kia Motors America, Inc.
Read what drivers complain about to CarComplaints.com about the Kia Sephias and other Kia models.